On Saturday the suspension of most European Union targeted sanctions against Belarus came into effect. 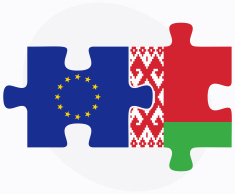 The sanctions were suspended ​“in response to the release of all Belarusian political prisoners on 22 August and in the context of improving EU-Belarus relations”. Ironically, the move comes a few weeks after the facade presidential election in October 2015. The move shows that the EU's expectations of Belarus have become much lower. In the late 1990s the West expected from Belarus free and fair elections and greater respect for human rights. A regime change in Belarus looked realistic then. Twenty years later the main expectation of the European Union is not significant political changes but avoiding violence against political opponents and securing the release of political prisoners. Although the European Union is not for the first time changing its policy from one of sanctions to engagement, fundamentally little has changed inside Belarus over the last decade. Freedom House rankings of Belarus show almost the same scores for democracy, independent media and civil society in that period. The authorities conduct elections which are neither free nor fair, imprison and then release their political opponents and keep civil society under pressure. The changes in the European Union's​ approach reflect not so much changes inside Belarus but changes in the regional context. In the late 1990s Russia looked like an emerging democracy moving in the right direction. Lukashenka was an abnormality who had to be ostracised. Belarus as a small and unimportant country was easy to sanction. Now Vladimir Putin is rigging elections, staging wars in the region and conquering foreign territories. This makes Lukashenka look rather mild. He even appears as a guarantor of peace and Belarusian independence against the background of the Ukraine crisis. But although Russia is busy with wars in Syria and Ukraine, Belarusian statehood and independence today is more vulnerable than ever. In the post-Crimea world the tolerance for violence in the post-Soviet region has increased. Russia's appetite for influence in the region is growing. Instead of supplying Belarus with war planes, Russia wants to provide its pilots as well. The minds of Belarusians are also under pressure from Russia. Most people in Belarus watch Russian television as their main source of news, exposing them to high doses of anti-Western propaganda. The Belarusian authorities would like to replace this with their their own propaganda but are unable to do so without angering Russia. For the same reason, the Belarusian regime considers it foolish to make any significant moves towards the West, and instead prefers to stay in the shadow of Russia. Lukashenka has made the country extremely vulnerable and dependent upon Russia. This does not mean, however, that Belarus should be punished for it and abandoned because of Europe's fatigue and preoccupation with other problems. The European Union should not just lower its expectations but take more active steps to become more visible and influential inside Belarus. This should include long-term programmes in the area of education, scholarly exchanges in the framework of the Bologna process, and strengthening the civil and national identity of Belarusians. Finally, it is important to lower the visa barrier. Ironically, while hundreds of thousands of migrants cross the European border without any visas, Belarusians have to undergo long, expensive and often humiliating procedures to go to the West. It happens not because the government prevents them from leaving, as in the Soviet times. The main obstacle is that European Union states prefer to issue short-term visas and charge the full price. Belarusian nationals face much stricter visa requirements than citizens of Russia or Ukraine. 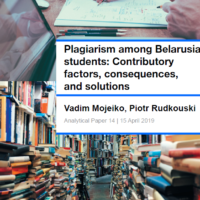 The policy of the European Union towards Belarusians should remain favourable even when the government of Belarus does not want to liberalise or open up the country. It is in the long-term interest of both the people of Belarus and the European Union to do so. The suspension of air traffic between Ukraine and Russia on 25 October has created a new opportunity for Belarus. The national air carrier, Belavia​, and the national aviation authorities reacted quickly by increasing aircraft capacity on the routes between Minsk and Kyiv and negotiating with Kiev over the opening of new routes to Ukraine. Belarus already has experience in profiting from many sanctions and trade wars, which Russia has waged against Europe and its new allies in the post-Soviet space. It looks like the government of Belarus is hoping to gain not only short-term benefits out of the Ukraine-Russia airline conflict. On 17 September, Ukraine introduced sanctions against twenty-five Russian airlines in punishment for their flights to annexed Crimea. In retaliation, on 29 September the Russian aviation authorities banned five Ukrainian airlines from flying to and from Russia. As a result, when the winter timetable kicked in on 25 October, all air traffic between Ukraine and Russia stopped. It is estimated that over 70,000 passengers flew routes between Russia and Ukraine each month. Now, they will have to use other means of transportation such as trains, or reach their destination through a transit airport in a third country. Ukrainian and Russian passengers have several options for indirect air travel, including Chisinau (Moldova), Vilnius (Lithuania), Riga (Latvia), Warsaw (Poland) and even Istanbul (Turkey). However, Minsk has a number of advantages over most if not all of them. First, travel time. The combined time in the air for travel from Kyiv to Moscow via Minsk is roughly 2 hours and 10 minutes. The second-best route, via Chisinau, is 20 minutes longer. Even when one counts the stopover time, Minsk remains the best option. Second, the formalities. Ukrainians travelling to Russia via Belarus will pass border and customs controls in Minsk airport and not at Moscow and other Russian airports. It may be an advantage given the tense relations between the two countries. Belarus has already profited from another case where air travel was disrupted and partially ceased. In August 2008, in the aftermath of Russian military aggression against Georgia, the two countries severed air links. Regular service only resumed in August 2010. 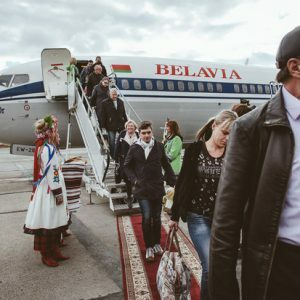 During that time, the Belarusian national airline Belavia increased the frequency of flights between Minsk and Tbilisi from three flights per week to daily services. Some Georgians nicknamed this route a “lifeline” as it became one of the best options for Georgians to travel to Russia, where they have family and business projects. Even after direct flights between Georgia and Russia were gradually restored in 2010 and fully normalised in 2014, Belavia maintained the daily flight frequency between Minsk and Tbilisi and introduced flights to Batumi (now twice a week) and Kutaisi during the summer. There is another reason for the continued popularity of the Minsk transit route among Georgians. Belarus has visa-free regimes with both Russia and Georgia, while Georgians need visas to travel to Russia. Many Georgians, who cannot or do not want to apply for a Russian visa, travel to Belarus. There, they take advantage of the absence of passport controls on Belarus’ eastern border and travel illegally to Russia by rail or road. Besides air transit, Belarus has on previous occasions managed to profit from the numerous other sanctions and trade wars in which other post-Soviet states have become involved. In 2006, Minsk refused to join Russia’s ban on the importation of Georgian wine and mineral water. Due to the absence of customs controls, Belarus became an important transit route for smuggling these drinks into Russia. More recently, Belarus became the primary beneficiary of the food embargo which Russia introduced against Western nations in August 2014. This success was partially down to the hard work of Belarusian producers as well as the inventiveness of local smugglers. The Belarusian authorities quickly reacted to the mutual Russian – Ukrainian travel ban. On 1 October deputy minister for transport Jauhien Rahachou announced that Belavia and Minsk National Airport were “fully ready” to receive transit passengers going to Ukraine. “We would like to avoid making any fuss about it”. Belavia now has 14 flights per week to Kyiv. Its code-sharing partner, Ukraine International Airlines, doubled the number of its flights to Minsk to fourteen in an effort to catch up with the growing demand. Belavia is also trying to negotiate an increase in flight frequency to Ukraine. The most immediate plans include the launching of a third daily flight to Kyiv. In the meantime, Belavia has responded to the changing situation by allocating higher-capacity planes on the route to Kyiv. “When we saw that the occupancy of our aircraft was increasing, we decided to replace the 50-seat CRJ-200 aircraft with the 148-seat Boeing 737-300”, said Ihar Charhiniec, Belavia's deputy director. On 25 October, Belavia opened a new route to Odessa, starting immediately with daily flights. This was a long-planned enlargement of Belavia’s network not related to the air traffic ban. Regardless, the new destination is destined for success because of the new circumstances. The other part of the transit link also looks good. Belavia has seven daily flights to Moscow and three daily flights to Saint-Petersburg. It flies twice a day to Kaliningrad and several times a week to Krasnodar and Sochi. Russia's national airline Aeroflot operates five daily flights to Minsk from Moscow. The number of flights between Belarus and Ukraine may further increase quickly. Currently, the two countries' airlines and aviation authorities are negotiating the opening of new routes linking Minsk with Zaporizhzha and Kharkiv in Ukraine. Other possible options include Dnipropetrovsk and Lviv. Belavia will have to share these routes with its Ukrainian colleagues. The reopening of limited air traffic between Kyiv and Moscow remains a possibility. Nevertheless, Belavia and Minsk National Airport are determined to profit from another round of crises in Russian – Ukrainian relations. Uladzimir Koscin, the head of the Belarusian department for aviation, forecasts a 5%-7% increase in passenger flow through Minsk airport. However, Minsk airport, which was renovated with Chinese money in 2014, remains seriously underused. Despite this new opportunity, it has little chance of becoming a regional transport hub until the Belarusian government radically improves its image to lure foreign tourists and businessmen to the country.